Documenting America's Environments: Then And Now : The Picture Show In 1971, the the EPA sent photographers around America to document the environmental state of the country. Forty years later, the agency is doing it again. Photographer Michael Philip Manheim talks about returning to some of the locations he photographed. In 1971, when the Environmental Protection Agency was in its early days, someone at the agency got the idea to send nearly 100 freelance photographers around America to document the country. These weren't postcard shots, but pictures of street corners, freight yards, parking lots, alleyways — wherever people were working and living. It was called Documerica, and it went on for seven years. A young photographer, Michael Philip Manheim, joined the Documerica project in 1973. His assignment was to take a good look at the noise pollution in Boston from Logan International Airport. Forty years later, he went back to East Boston to take photos for the EPA's next generation of the project, State of the Environment. Manheim joins Weekend Edition Saturday host Scott Simon to talk about the project then, and now. "The people who lived ... in the vicinity ... were having a very, very big problem. The airport grew and grew and grew, and needed more and more land, and ... the people ... were so hurt by the noise pollution because at that point, the airplanes would land and take off right over their street. ... I documented cracks in walls in the homes, people with severe hearing problems. It just went on and on and on." "There is one house left out of this huge neighborhood, and what you see there are, well, the trees, some of the street signs and warehouses that are connected with either the airport or other serviced industries ... the neighborhood was decimated." "We were shooting slides — chromes. So it's easier to do these things [now], but you still need the eye, you need the reflexes, you really have to have a compositional sense. So, the expression, 'Everyone is a photographer,' well, it does take a professional. I have to admit." In 1971, the EPA sent photographers around America. Forty years later, they're doing it again. 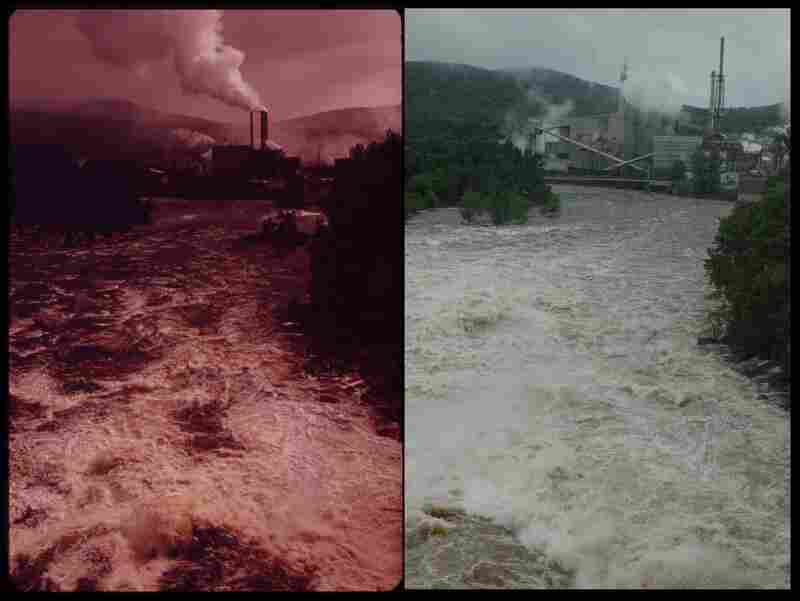 Oxford Paper Company Mill, Androscoggin County, Maine, in 1973 (left) by Charles Steinhacker and 2012 by Victoria Hampshire.